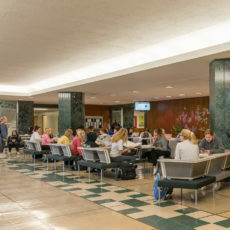 Breathing new life into the Lilly Hall of Life Sciences Lobby With its prime location and frequent traffic by Purdue University students, faculty, and staff, the lobby at the Lilly Hall of Life Sciences held promise as a collaborative environment. 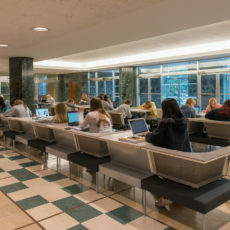 However, with the lack of furniture in the space, students would either stand or sit on the floor in groups before and after classes, affecting traffic flow. 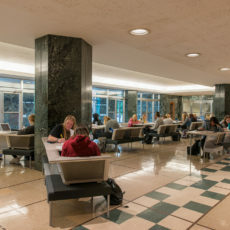 Recognizing the potential of the lobby, Purdue University began exploring how to develop it into a welcoming area that fostered interaction. The university engaged OfficeWorks to provide Herman Miller seating and surfaces that would activate the space while accommodating the limited budget. With experience furnishing areas for higher education and other similar spaces, OfficeWorks offered options that were sensitive to the dynamics of the environment. The layout and application of Herman Miller’s Public Office Landscape allows for effective circulation in the lobby, which serves as the building’s main entrance and exit point. In addition, it gives the university flexibility for future reconfigurations or additions. Given the furniture’s high volume of usage, OfficeWorks also recommended fabric and finishes that would stand the test of time, based on research and results in other projects. “I enjoyed providing suggestions based on the university’s goals and what would work best for them,” said Amy Stamper, OfficeWorks account executive. When students arrived on campus for the fall semester, it soon became clear that Purdue University had met those goals. The university has received positive feedback about the space, and it has been extremely well received.